Since becoming Editor of WPP, I've been fascinated by Japanese carpentry. a hammer and a waterstone set. 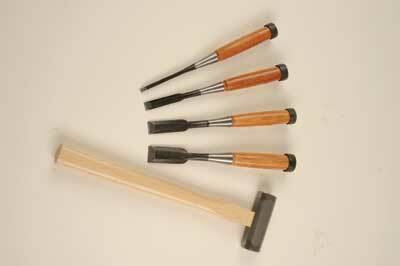 Oire Nomi chisels are the standard Japanese general purpose bench chisel. They have hooped handles designed to be struck with a metal hammer, but are OK for paring too â€“ though they have short blades so specialist paring chisels are better. As is standard with Japanese chisels, it is a bi-metal blade with a hard cutting edge steel married to a softer, more flexible backing iron, producing a lasting, cutting edge with a flexible shaft. The hoop on the handle keeps the handle head in one piece, as it mushrooms out over it. Japanese chisels shouldn't be ground on a bench grinder, as they have a primary bevel that is more acute than Western chisels, and the round from a bench grinder would weaken it. So you need a purpose-made set of waterstones. 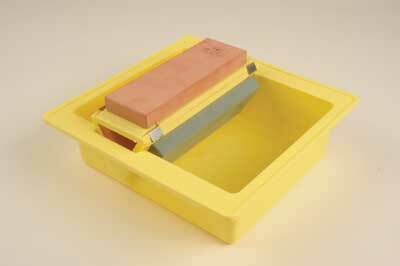 Axminster's stone pond set has 220 grit for grinding a primary bevel, and 1,000 and 2,000 grit for honing. The first job is to flat the back of the chisels. They come with the standard Japanese hollow grind on the back which keeps the back of the chisel free from the timber. 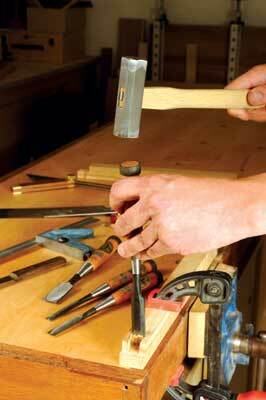 As you flat the back, the hollow moves up the chisel, so you always have a flat back to the edge. After flatting the back on the 1,000 then 2,000 stones, I honed the secondary bevel. The combination of hard cutting edge and the waterstones produced a scary sharp edge that lasted very well. 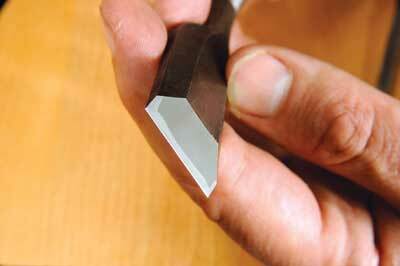 When the honing bevel becomes too big, the primary bevel needs a re-grind, and a honing guide is recommended here. To try out the chisels, I cut a typical Japanese joint - a half lapped dovetail... a new joint for me. I cut it in oak, and found the chisels, both when chopping and paring, made short work of the oak. The 375g Hakkaku Genno hammer was perfectly suited, and allowed for a lot of feel and control. My only minor gripe is that the chisels have smaller handles than I am used to, which didn't suit my hands. This was my first time with Japanese chisels, and I found them to be a pleasure. These are well put together, and take a very fine edge. I wouldn't replace all my chisels with Japanese versions, but will definitely have some in my toolkit.